In an ancient stone quarry underneath Jerusalem's Old City, women tottered on stilettos down a dimly lit passage on their way to a very modern ritual: speed-dating. Hoping the exotic setting would provide a conducive backdrop for romance, organizers brought about 60 Israeli singles to the subterranean quarry known as Zedekiah's Cave late Sunday for a unique speed-dating marathon to mark the 15th day of the Hebrew month of Av, the Jewish holiday of love. "It's like Valentine's Day, but it's an Israeli holiday, so I think there's something in the air," said Shiran Avioz, 28, a sales manager. "You think, maybe this is the day." For Avioz, the cave worked its magic: She exchanged phone numbers with a handsome bodyguard from Jerusalem. 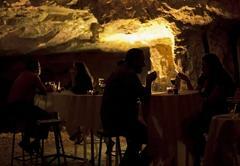 Inside the 2-millennia-old quarry, which was the source of some of the limestone used to build the Old City, the singles took their spots at candlelit white tables. Every seven minutes, the men switched tables at the ringing of a bell. "Our goal in the speed dating was for people to come and see Jerusalem and its ancient sites," said Hila Zisberg, one of the organizers. "We hope they fall in love with the city and with each other. And we hope they will come and build their homes in Jerusalem." Her group, Youth for Jerusalem, seeks to connect young people with the capital's history. One third of Jerusalem's 790,000 residents are Palestinians, another third are Orthodox Jews, and the city struggles to attract and retain secular young Jewish Israelis against the pull of cosmopolitan Tel Aviv. Speed dating arrived in Israel more than a decade ago, but Israelis have never tried it in one of Jerusalem's ancient sites. The singles made their way into the cave's tunnel-like entrance under a full moon via Sultan Suleiman Street, a main thoroughfare in Jerusalem's largely Arab eastern sector. Blue lights hung regally from the Old City walls for the Muslim holiday of Ramadan. Each participant paid about $7 for an evening that included wine and sandwiches. The Jewish Internet dating site JDate sponsored the event, along with the Israeli government's East Jerusalem Development company, Zisberg said. The 15th of Av -- known in Hebrew as Tu B'Av -- is mentioned in the Babylonian Talmud, a compendium of Jewish oral law and stories about 1,500 years old. "We have a clear tradition of Tu B'Av as the holiday when the daughters of Israel would go out and dance in the vineyards, and they would invite the boys, in short, to take them" as brides, according to Dr. Ruhama Weiss, professor of Talmud at Hebrew Union College in Jerusalem. In the last decade, it has morphed into a commercial Jewish Valentine's Day: Restaurants offer special romantic menus, smitten partners buy each other gifts, and store shelves overflow with flowers and hearts. Speed dating is part of that, Weiss said. "In ancient times, people lived in the village and knew each other," she said. "Speed dating is built for the Western world." Guy Ashkenazi, a computer engineer in his 40s, said he drove 40 minutes to take part in the event because of Jerusalem's special atmosphere. "It's the city of David and Solomon," Ashkenazi said. "There's something spiritual here, and I think that maybe if I will be in Jerusalem, it will help me find what I'm looking for."